Nothing ever goes as smoothly as we’d like. There is always conflict at home and work, and we have to deal with it. Few of us have effective strategies to deal with the conflict though. You can find an audio version of this. Make sure you subscribe to Should I Read It so you don’t miss a book that matters. That’s where Play Nice in Your Sandbox by Ron Price, comes into play. 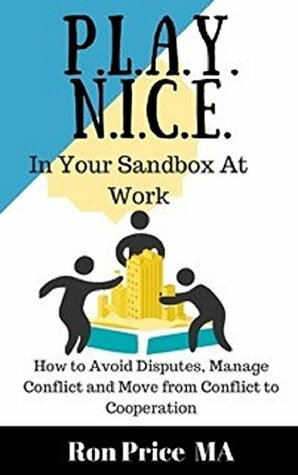 Price is going to give readers a short look at effective conflict resolution and negotiation. Dealing with conflict in a productive way is the greatest challenge we have as a society and as individuals. Price starts this by reframing how we think about conflict. It doesn’t have to be thought of as bad because it often isn’t. Conflict can be handled in a way that is beneficial to both parties and their relationship, personal or professional, can take on a new level of thriving after a conflict well handled. Disputes and conflict can actually be healthy experiences when handled well. If everyone on a team thinks identically then some members are likely not necessary. Occasional disagreements can bring about new ways to get things done, spur efficiency, and create better products. There are two truths that Price walks readers through. First, he tells us that most conflicts should be avoided and uses chapters 1 – 4 to detail how and why to avoid conflict. The second truth is that when conflict is handled well, it can be very productive. He uses chapters 5 – 8 to tell us how to handle conflict well. Let’s look at each of these truths. Price starts of truth one by giving us three questions to ask ourselves when we’re thinking about engaging in conflict. The answers to these questions should lead us to either head into the conflict or realize that it’s not worth it. According to Price, if you answer no to any of these, then conflict is worth the effort. Otherwise, we need to look to our conflict avoidance tools. In avoiding conflict, the first tool that Price provides us is the pause button. This is where you increase the time between stimulus and reaction which is a key goal of most meditation practices. You cannot control how others treat you, but by pushing the pause button, by taking time to choose your response to situations, you can be far more in control and far more likely to make appropriate decisions. This recognizes that you are in charge of how you feel and that you must make a choice to respond appropriately. I get reminded of this when my children argue about the name of some character on TV. They hear it one way, and I’m reading it on IMDB in the way it should be pronounced. Ultimately it doesn’t matter in any fashion, and when I take a second, I just agree with them instead of trying to correct them. No one cares, and if they do, they’re wasting their time. A second great tool is provided in the form of a story by Price. The story goes that an older person in the company is always viewed as always so gracious and thus is asked how he does it. He says that he has a list of the top 10 faults of people and when something comes up in the list, he just applies grace to it and doesn’t worry any further. Then another employee asks to “trade” lists, and it’s revealed that there is no list. The staff member just applied it to every time he got annoyed at how someone treated him. He decided to give grace in all situations. This leading with grace thought leads nicely into the second tool. We always judge ourselves by our intentions and others by their actions. That means when my kid is constantly going on with “suggestions” on some home project, and I can’t think, I get annoyed. I’m judging the actions she’s using, not stopping talking1 so I can think for a second. But see, she’s doing it to be helpful, and that’s how she perceives her actions. When I get annoyed at the non-stop talking, she’s mad because I am stomping on her help. Price describes it with these few quotes from the book. Everyone you are close to will, from time to time, do or say things you do not appreciate. You can choose to give the other the benefit of the doubt that he or she didn’t mean to upset you. And if they did, it’s likely they were having a bad day and wrongly took out their frustrations on you. Finally, remember it doesn’t matter WHY they did anything or why you were treated in a certain way. It happened, and now you have to deal with it. Assume grace and move on if at all possible. So much of conflict doesn’t matter at all. When my wife and I disagree on the movie to watch on Friday, does it matter at all? No, the content of the magic wall box makes no difference in life. Usually one of us tells the other to pick, and we spend time on the couch together with each other anyway. There is a bit more to yielding than that though. According to Price, we need to take time to understand where the other person is coming from. We must listen well. To listen well to another human being you must choose to make listening a priority. You must choose to make listening a priority. You must prevent your thoughts or distractions from getting in the way. This matches up very well with 7 Habits of Highly Effective People where Covey talks about first seeking to understand someone before you work to be understood. Far too often, in fact maybe most of the time, we are waiting for our turn to inject something “smart” into the conversation instead of trying to deeply understand what is being said. Even when we understand the words, do we take the time needed to understand the deep-seated fears and emotions behind what is being said? Empathy is listening not only with the ears, but with the heart. It involves deeply listening not just to what another is saying with their mouth, but what message is coming from their core. Once you understand the core of someone’s issues, it’s very easy to come to a quick resolution that both of you think suits. Once someone feels understood, they’re very likely to dig in with you to understand where you’re coming from. The essence of this tool from Ron Price is to be the first person to take the time to listen deeply. Yield your position and understand the other person’s side in the conflict. With that, we’re on to section two and dealing with the conflicts that can’t be avoided. Truth two is all about how to deal with conflict effectively. Price again provides us with some tools to use in conflict resolution. Too often, when engaged in a dispute, we tend to demonize the other and think all sorts of negative things about their character, their personality, their intelligence and so on. We strive to make them into such a terrible person to justify our being in dispute with them. That may be enjoyable in some perverse way, but it will do nothing to help resolve the issues which underlie the conflict. The “other side” in a dispute is not dumb. They have very valid concerns that they want addressed. In fact, you’re in conflict now because those issues haven’t been resolved with other available methods. Second, this is not gladiator combat. No one will die at the end. Good conflict resolution shouldn’t leave one party feeling like they got a terrible deal but they had to take it because it was the best they could get. Both parties should feel like the deal is as mutually beneficial as possible. Choose to separate the person from the problem, focusing on what really has come between you. When you do so, you will typically discover your “adversary” is in fact someone who is very much like you in many regards and certainly not worthy of your hostility and contempt. Conflict resolution shouldn’t be rushed either. You’ll be better off long-term if a resolution takes a few extra weeks or months instead of doing it quick and dirty in a few days to get the pain over with. That’s like putting a bandaid on cancer. It will cover the problem, but solve nothing. You’ll be back dealing with the conflict again eventually. The second tool provided by Price is very similar to the third tool in Conflict Avoidance, you need to understand what the other person wants. Don’t dwell on the specific item asked for. The item itself likely represents the feeling behind it. You must dig deep to find out why it’s important and often you can find an alternative that suites both parties. Where are the other tools?? Now there starts to be more repeat in the content of the book. Tool three is about working with someone to a mutually beneficial result. Which is a nuance on understanding them and not treating them as an adversary. It does add one key point outlined below. By the time they come to mediation, each person has likely spent dozens, if not hundreds, of hours contemplating their side of the issue and what they think should be the eventual outcome. Rarely have they spent much time thinking about what might motivate the other to be willing and able to move on. This is formally called perspective taking and is a great way to realize that you’re probably worked up over something that’s not as big a deal as you thought. At the very least, you didn’t understand how important it was to the other side, and it’s not important to you so just yield. The final tool is around exploring options. If you go in with the mindset that you won’t be able to solve the problem, you’re right. This harkens back to the quote saying “Whether you think you can or you can’t, you’re right.” You’ll let your internal thinking turn into a self-fulfilling prophecy. Don’t do that. Go in with an open mind, thinking that you can resolve the issue. The final short section is all about mediation and arbitration so that you have an overview of what the processes look like usually. This will help you choose which process may be right for your situation. If you’re looking for a quick read on negotiation to get your working knowledge primed, this is a great book. If you’re looking to go deep into negotiation get Never Split the Difference. It will give you much more on the psychology of negotiation and more tools to use in the midst of conflict. A short book that is a decent primer on negotiation. Are You Measuring The Gain or the Gap?